SEGWAY-NINEBOT, a worldwide leader in electric personal transportation, is setting the new standard of karting with its electric Gokart: â A Revolutionary Electric Gokart from Segway. â¡The first Gokart ever that is made to drift. â¢The Gokart with the fastest initial acceleration. â£Adjustable frame allows for a variety of rider sizes â¤Designed for all ages. â¥Winner of Reddot Award 2018: Best of the Best. One Product, Twice the Fun: Why have just one fun product to ride when you can have two? Instead of creating an electric gokart from scratch, we’ve designed the Ninebot Gokart Kit to work with the Ninebot by Segway miniPRO. Attach your miniPRO to work as the gokart’s motor, or detach it and ride it hands-free. â 3-Driving Modes: The Ninebot Electric Gokart comes with three driving modes for riders to choose based on their expertise. Novice mode has a top speed of 5 MPH (8 km/h), the Standard mode has a top speed of 10.8 MPH (18 km/h), and Sport mode has a top speed of 15 MPH (24 km/h). â¡Long Driving Range: The battery life of the Ninebot Electric Gokart varies across the different driving modes, with a maximum range of 12.4 miles (20 km). It takes about 3.5 hours to fully charge the battery. â Reverse Enabled: Unlike most gokarts, the Ninebot Electric Gokart comes equipped with the ability to go in reverse. Once at a complete stop, quickly tap the brake pedal twice and the gokart is now in reverse. When stopped, tap it twice again to go back to forward. 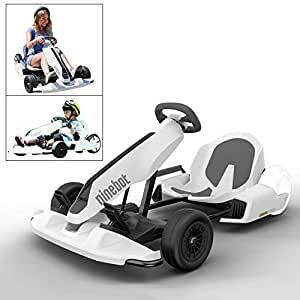 â¡A Gokart Ready-to-Travel in Your Trunk: The Ninebot Electric Gokart is collapsible to fit in most trunks, allowing you to take it wherever you want to go. Notes: Buyer needs to purchase the self balancing scooter separately. The Cutting-Edge Electric Gokart by Segway-Ninebot,a drifting machine that speeds from 0-12mph in 2s. The Ninebot Electric Gokart was designed with an adjustbale frame and steering wheel to fit riders between 4′ 5″ to 6′ 3″ (130 cm – 190 cm). The Gokart has a maximum payload of 220 pounds (100 kg).The Ninebot Electric Gokart has a steering ratio of 2.1:1, allowing for precision steering and the ability to make the very tight turns.